We want to extend a special congratulations to Mrs. Georgia International Jacqueline Boatwright-Daus. 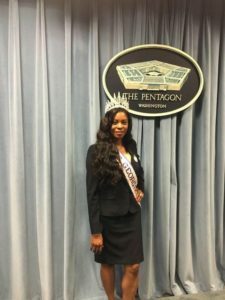 She was recently invited to the Pentagon to speak with senior members about the continued importance of daycare safety and the need for improved regulations. As many of you know, Ja ckie is known as the woman who single handedly changed the face of child day care in Georgia through her advocacy which resulted in the passage of Juan’s Law in 2004 named in honor of her late son who died as a result of injuries sustained at his state licensed child care center. Her tenacious fight for change was again victorious in the state of Virginia who also passed Juan’s Law in 2006. 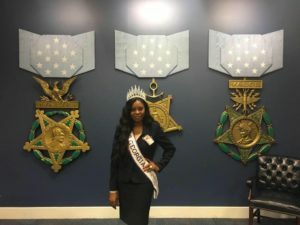 She took her fight to the United States Capitol and gained another success for her cause with the passag e of The Anthony DeJuan Boatwright Act in 2009. Jackie is truly carrying on the legacy of beautiful son Juan. A tragic situation at a daycare, like the one that happened to Jackie’s son, should never have to happen again! We all can cary on Juan’s legacy by continuing to reach out to local and national officials to make sure that the topic of daycare negligence stays on their agendas each and every leadership session. At the very core, the safety and well-being of our children is cause that should unify all members of legislative body in Georgia and our county. For more information on daycare negligence or ways to become involved in helping with our efforts to improve the standard of care in daycares across Georgia and the country, please contact us at (404) 566-8964 or kevin@patricktriallaw.com. We are one of the few firms in Georgia with a practice specifically focusing on daycare negligence. You can also visit Jackie’s website for more details on becoming involved in this noble and wonderful cause. Together we can truly make positive changes in our community and, most importantly, prevent daycare negligence. Our first blog post in this series focused on Requests for Admission in automobile accident cases. You’ll remember that Requests for Admission ask the other party to admit or deny certain parts of the case. Interrogatories are a useful discovery tool. They are different though because they are asking the other party basically to provide a written response to questions, such as describing in their own words how he or she caused a car accident. Georgia law again can appear rather technical, as you can see from O.C.G.A. 9-11-33, but we are going to show you some general templates to help streamline this process for automobile accident cases. (a) Availability; procedures for use. (1) Any party may serve upon any other party written interrogatories to be answered by the party served or, if the party served is a public or private corporation or a partnership or association or a governmental agency, by any officer or agent, who shall furnish such information as is available to the party. Interrogatories may, without leave of court, be served upon the plaintiff after commencement of the action and upon any other party with or after service of the summons and complaint upon that party; provided, however, that no party may serve interrogatories containing more than 50 interrogatories, including subparts, upon any other party without leave of court upon a showing of complex litigation or undue hardship incurred if such additional interrogatories are not permitted. (2) Each interrogatory shall be answered separately and fully in writing under oath, unless it is objected to, in which event the reasons for objection shall be stated in lieu of an answer. The answers are to be signed by the person making them, and the objections signed by the attorney making them. The party upon whom the interrogatories have been served shall serve a copy of the answers, and objections if any, within 30 days after the service of the interrogatories, except that a defendant may serve answers or objections within 45 days after service of the summons and complaint upon that defendant. The court may allow a shorter or longer time. The party submitting the interrogatories may move for an order under subsection (a) of Code Section 9-11-37 with respect to any objection to or other failure to answer an interrogatory. (b) Scope; use at trial. (1) Interrogatories may relate to any matters which can be inquired into under subsection (b) of Code Section 9-11-26, and the answers may be used to the extent permitted by the rules of evidence. (2) An interrogatory otherwise proper is not necessarily objectionable merely because an answer to the interrogatory involves an opinion or contention that relates to fact or to the application of law to fact; but the court may order that such an interrogatory need not be answered until after designated discovery has been completed or until a pretrial conference or other later time. (c) Option to produce business records. Where the answer to an interrogatory may be derived or ascertained from the business records of the party upon whom the interrogatory has been served or from an examination, audit, or inspection of such business records, or from a compilation, abstract, or summary based thereon, and the burden of deriving or ascertaining the answer is substantially the same for the party serving the interrogatory as for the party served, it is a sufficient answer to the interrogatory to specify the records from which the answer may be derived or ascertained and to afford to the party serving the interrogatory reasonable opportunity to examine, audit, or inspect such records and to make copies, compilations, abstracts, or summaries. Just like Requests for Admission in car accidents cases, a general template for Interrogatories is a good starting point, and then you can modify them for your specific case. Each case is unique so remember that there’s no “one-size-fits-all” approach so it’s important to contact a car accident attorney right away to help guide you through your case. State your full name, current address, current employer, date of birth, last four number of your social security number, and driver’s license number. (c) Has conducted any investigation relating to the incident underlying this litigation or the background, employment, medical history or activities of the Plaintiff. Identify any and all statements or reports given by any person identified in your response to Interrogatory No. 2. Has any insurer referred to in your answer to Interrogatory No. 4 denied coverage or reserved its rights to later deny coverage under any such policy of liability insurance? If so, please explain. (b) Each and every document or tangible piece of evidence that will evidence those facts. (c) Give a complete summary of the grounds for each opinion held. Were you on the business of any individual or entity at the time of the subject incident? If so, please identify any such individual or entity, including name, address and telephone number. If you have ever been arrested or convicted of any crime (other than minor traffic offenses), even if that arrest or conviction has been removed from your record, please identify each crime or alleged violation, date of arrest, the arresting authority, the court in which any criminal proceeding against you was held, and the disposition of each charge. State each and every prior collision or prior insurance claim which you are aware of that the Plaintiffs have been involved in, or the Plaintiff has made, and state whether your agents have procured an ISO claims index report. What do you contend caused the incident underlying this litigation? Do you contend that you have been improperly named as a party to this action and/or that improper or incorrect agents for service were utilized to effectuate service upon you? If you answer to either of these inquiries is “yes,” please provide a detailed explanation as to why you contend that you have been improperly named or the agents used for service were improper and provide the complete and correct name of the entities or individuals you contend should have been named and/or served. Do you contend that venue is improper in this court, that jurisdiction is lacking over you in this Court, or that service of process has been deficient in this matter? If so, please describe and state with specificity all factual and legal basis supporting any such contention(s). (d) If you did not own the vehicle, state whether or not you had the permission of the owner to be driving the vehicle at the time of the subject incident. Do you have a driver’s license? If so, please state when you first acquired any driver’s license, what type it is, and what are/were the restrictions on it. At any other time, either before or after the subject incident, have you ever been arrested for driving under the influence or for any other drug or alcohol related charge? Do you have a cell phone? If so, please state your cell phone number and the name of your cell phone provider. Please produce a privilege log identifying each and every document you contend is privileged and stating the particular privilege for each. (c) Each fact upon which your denial is based. Describe in detail how the collision on [INSERT DATE] happened, stating in your answer all events relating thereto in their sequential order, including all actions taken by you to prevent the collision. State the name, web address, and user name for all blogs, online forums, and social networking websites that you have belonged to or had a membership in the prior twelve (12) months. We recognize that the key to a successful recovery in an automobile case is a clear discovery path and a willingness to bring your case to court. In fact, we used to represent insurance companies. Strong discovery makes sure that those companies understand you are serious about getting the best result for your car accident. As always, feel free to contact us at (404) 566-5880 or information@patricktriallaw.com if you have any questions about your car accident and need legal assistance. I wanted to personally thank you for all that you did. I really appreciate the customer service and staying connected with me through the latter part of the case process. You handle personal injury cases all day but for the client it’s once every twenty years or more. So therefore we need to know and understand the process as much as possible. At Kevin Patrick Law, we care deeply about our clients. One of our main goals is making sure that we keep everyone up-to-date and informed throughout the process. It’s your case, and we work for you! Importantly, there’s no such thing as a silly question. If you or a loved one has been hurt and needs an attorney, please contact us at kevin@patricktriallaw.com or (404) 566-5880.